Hurray – it’s almost that time of year again when the sales team all hide behind unnaturally tall tables, while desperately trying to appear professional in their (ill-fitting) branded polo shirts, stylishly matched with their business suit trousers. Yes – it’s trade shows season – or at least it soon will be. And I can guarantee that – for at least 80% of the businesses who take a stand – it’ll be a complete waste of money. Over the past couple of years we’ve worked closely with a number of clients to build workshops that prepared their teams to be 10X more effective than in previous years – and ensure they got the absolute best ROI at every exhibition and trade show they’ve attended since. So – before you start to root out all those pop-up banners that no one ever puts away properly – and for all you people who have decided that the time has come to engage in more meaningful conversations than the ones you have with the semi-clad models who hand out pens and flyers – I’ve listed a couple of nuggets from those workshops below. Put this advice to work – and I promise you – your stand will be one of the most effective, professional and successful in the entire hall. You are not a charity worker standing on the street accosting innocent passers-by, nor are you knocking on people’s front doors trying to make them change their religion. The people walking past and hanging around your stand chose to be there today – more importantly, someone has probably paid them to be there. Are you evangelical about the solution your company delivers? If not – why not? 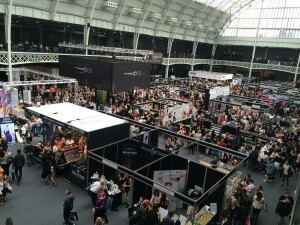 If all the people coming within ten feet of your booth can be classed as prospects or potential customers (and if they’re not, then you’re probably at the wrong show my friend) – find out if and how you can help – and then show them. And do it RIGHT NOW before they walk straight past and go round the corner to your unscrupulous competition, who are just sitting there waiting to rip them off and sell them something that won’t do the job half as well for twice as much. When someone lingers and looks your stand up and down, approach them immediately and invite them to find out a little more about your products or services. Oh – and don’t keep anyone waiting for no reason – studies show that people will give you a maximum of 30 seconds before they start to feel unloved and move on – and they probably won’t come back. What is the main purpose for attending this event? Work this out – write it down in a simple, easy to understand single line sentence – and then put every ounce of your energy into achieving that – and only that. This information is rarely communicated properly before an event – mostly because it’s assumed that everyone already knows it – but trust me, they don’t. When prospects float past you, tapping someone else’s brochure on their chin and trying not to make eye contact, it can be quite tough to engage them in a conversation or attract them to take a closer look. First of all – remember this – you’re not working in a shoe shop (unless you’re at a footwear trade show and then you sort of are). What I mean is, you don’t want to greet people with an uncomfortably tepid opener that just has them shuffling past even quicker and pretending not to have heard you. Also if you ask them a question that requires a yes or no answer – a large percentage of people will automatically give you a no. Then, once they join you on the stand, ask questions that filter those prospects down even further by concentrating the conversation on your own products or service. You don’t need a script or elevator speech – they rarely work, are dead obvious and sound naff. Instead, walk over to genuinely help – and then ask the right kind of questions to see if your product or service is going to be useful to them. I’ve worked for businesses where trade show attendance was mandatory – no one escaped trade show duty – it was the law. That makes sense if you’ve only got a small team or the trade show is region specific, but some people don’t shine in this kind of environment – and you really don’t want a stand of people who are treating the experience like some kind of punishment. If this is the company rule – make sure that it’s explained to everyone at the interview stage so that they can’t complain or turn in a bad performance when it comes round. If you’ve missed that boat, why not tell your sales team exactly what’s expected at the next sales meeting. After that, tell them that you only want the best of the best – this trade show is going to be manned by a hand-picked elite. Now invite them to put their names forward. By the way, those team members who you count amongst your sales superstars but who still snub this challenge, might not be as business hungry or brilliant as they’ve previously led you to believe. Don’t stand at the back like a First World War General sending the troops pointlessly over the top and hoping for the best. If you’re on the stand, you’re either there to sell, you’re a potential customer or you’re in the way. Engage with prospects in exactly the same way you expect your team to – lead by example, strive to be the most successful person there, lay down a silent challenge for everyone to try and keep up. However, you also need to make sure they don’t take advantage of – or hide behind – your high levels of activity. Make sure that – whatever it is you’re measuring – is being achieved in near equal measures by everyone on the stand. A Couple of pointers that shouldn’t need saying but…. * Don’t eat, drink, or smoke where prospects waiting for attention can see you. * Get off your laptop – what’s more important than being here? My new book – Selling with EASE: The Four Step Sales Cycle Found in Every Successful Business Transaction is now available from Kindle and as a Paperback. His other books include The Extremely Successful Salesman’s Club – which has been an Amazon Number 1 Best Seller and heralded as the Da Vinci Code for salespeople. This entry was posted in Sales Advice, Sales Skills, Trade Shows and tagged sales, sales advice, sales effectiveness, sales pitch, Sales Skills, trade shows on March 30, 2016 by Chris Murray.